Touching upon Ralph Bakshi's animated film, Wizards (1977), evokes strong memories for me. I was very young when I saw this film. Probably, too young. The plot centers upon two wizard brothers, Avatar and Blackwolf, and the battle initiated by the latter's desire for power through industrial technology. Avatar's ultimate quest is to thwart his brother's evil doings through the forces of magic, and therefore save Earth from destruction. Wizards is anything but cliche. It is a frenetic powerhouse of fantasy, horror, and humor seemingly born from the imagination of someone on acid. What other animated film can you watch that includes aspects of The Lord of the Rings, nuclear winter, and Nazi propaganda? But Wizards is better watched than explained. Contrary to creator Bakshi's labeling Wizards a family film, I wouldn't go showing this one to the kiddies. There are some pretty strong themes presented through cartoon bloodshed and violence. It's the film's art direction that left an indelible mark on me. 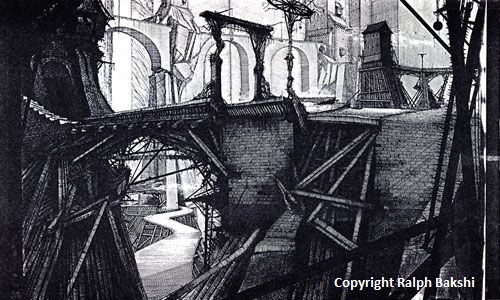 It evokes a foreboding mood that is experienced through the film's background designs by Ian Miller. Upon discovering Miller's website, the feeling of Wizards - as experienced when I was around five - washed over me all over again. I had to reach out to him. The following interview was conducted via email and is presented unmolested in its original form; errors and all. As one will read, Mr. Miller was most generous with his time, and his narrative is a pure delight! Even better, he has allowed me to share art that he created for Wizards (copyrighted by Ralph Bakshi), along with some photographs. 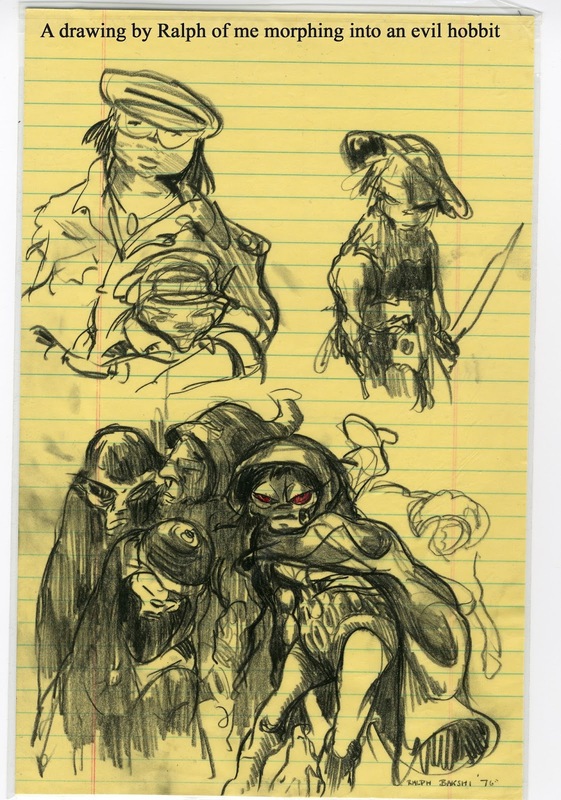 Regardless of whether you watch the film or not, Miller's art represents the foreboding mood of the film as envisioned by its creator Ralph Bakshi. It is the hope that the following interview will not only excite fans of Wizards and animation alike, but serve as a reliable source of information for the most serious of animation enthusiasts and historians. Art design for Wizards (1977) by Ian Miller. VR: What led you to the animation industry under Ralph Bakshi? IM: In the early 70’s I was asked if l would like to participate in a Fantasy calendar project being put together by Pan and Ballantine books. David Larkin, one of the best and most proactive art directors around at that time and incumbent at Pan suggested something from the Gormenghast trilogy might interest me. Having read Peake’s masterpiece and loved every word of it, I said yes without hesitation and the Gormenghast Castle image featured in the Fantasy calendar was duly born. Not long after completing this commission, my wife and I went on an extended holiday to San Fransisco; and whilst staying in the old Gaylord Hotel near Union Square, where the lift threatened to die every day, and the event of the week was the free doughnuts and coffee on Sunday mornings, we were tracked down and contacted by the Ralph Bakshi studio’s in LA. Having seen my illustration in the Fantasy Calendar Ralph decided that I was an ideal candidate to work on his new animated feature, which at that time was listed I believe as War Wizards. 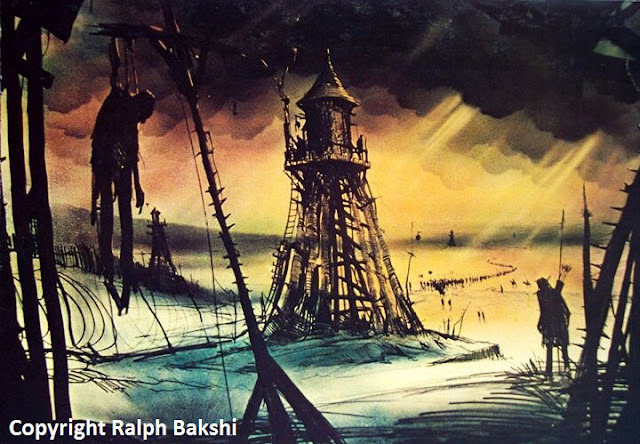 We were flown down to LA the day after I spoke with the Bakshi studios and I was offered a job on the spot. Truth to tell, we had been getting rather short of money due to the value of the pound crashing against the dollar at that time, so this was nothing short of a miracle . Needless to say I said yes and the rest is history. VR: According to Ralph Bakshi, there is no consistent style in Wizards. What challenges or opportunities did this present as a background designer? IM: Ralph told me what he needed me to do, then left me to get on with it. I was thrown into the deep end and expected to swim . Strange to say, I managed to do this with some measure of efficiency. Ralph’s continual encouragement helped the process immensely. It was a visceral whirly gig of: “Do this, try that -" through the length and breath of the building. Ideas bounced off every wall, as did the ping pong balls in the staff area, during the rest breaks. I was left to work my way through a list of scenes and suggestions Ralph thought he might need or perhaps include. Some worked some didn’t. When we reached parts of the film that had already be pinned down frame and story wise, I had to design and draw within specific and designated areas . This however was never a problem. The working atmosphere was always charged and sparky. It was fast lane creative, going on ‘free fall crazy.’ Everybody working there was at the top of their game, with me running hard to catch up. Happily, I was young, with plenty of energy. As a point of interest, Ralph spotted a small play dough dinosaur come lizard creature I’d made in a tea break, sitting on my desk and said “animate it!” I laughed thinking it was a joke, but he was absolutely serious, and instructed Art Vitello, one of the animators, to do just that. It’s in the film believe it or not. Ralph’s creative spontaneity was sometimes startling, if not down right alarming . Anything appeared to be possible. On a whim, well that’s how it seemed at the time, he decided I would do a couple of the elf voices, and took me over to the recording studios, with some of the other voice artists to do just that. I think it was at Paramount. Heady stuff, crazy even, but it was a hell of a lot of fun . 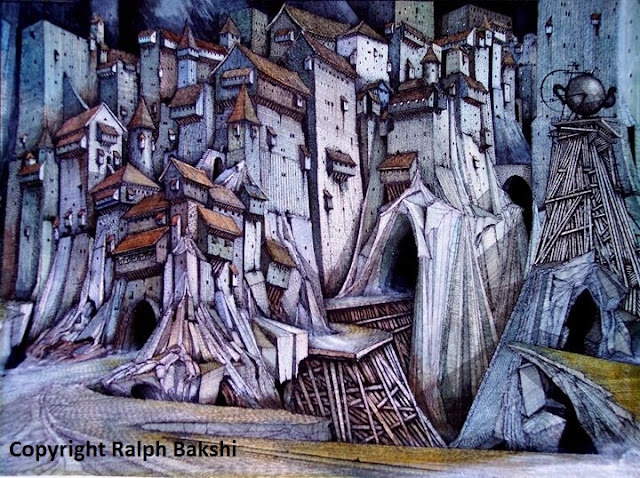 Background design for Wizards (1977) by Ian Miller. VR: As a background designer, how much say did you have in terms of color keying; especially in the sequences where rotoscoping was heavily used? IM: I don’t think that was ever a conscious issue for me, outside my remit almost. I did a great deal of the imagery in B/W and when I did use coloured washes, they went through without comment. There were some brilliant colourist /painters in the Studio who took care of the colouring. If I recall correctly, and I may of course be wrong, a goodly part of the rotoscope sequences used footage from several classic films. IM: Pencil and ink on paper - A mix of dip pen brush and technical pens. One of Ian Miller's designs for Blackwolf's domain. VR: What set Wizards styles apart from the rest of the animated films of the time? IM: I’m not sure I’m qualified to answer that question, but perhaps it was down to Ralph being Ralph, the product if you will, of his wanting to break established boundaries in the quest for new and more engaging methods of animating and story telling. VR: Do you have any recollections of Bill Orcutt? IM: Sadly I do not. Perhaps my secluded time at the drawing table was to blame. IM: Meeting Mike was one of the highlights of working on Wizards. He’s a wonderful fellow and an astonishingly accomplished artist. A book of his life and work came out recently 'The Art of Mike Ploog FPG and it is well worth getting hold of a copy. 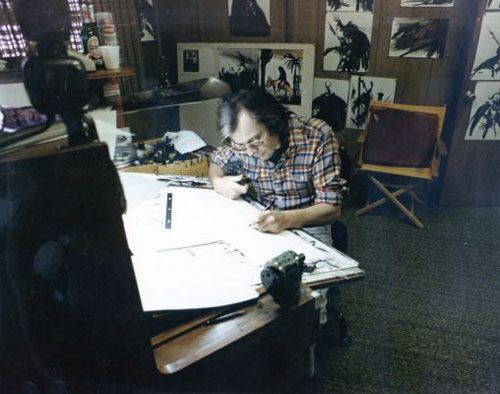 His visual contribution, and presence in the studio, was in my opinion, a vital part of Wizards unique character, magic even. Ralph held Mike in great esteem and justifiably so. Ralph once told me that he only hired the very best, and in Mikes case that was absolutely true and Huzzah! for that. 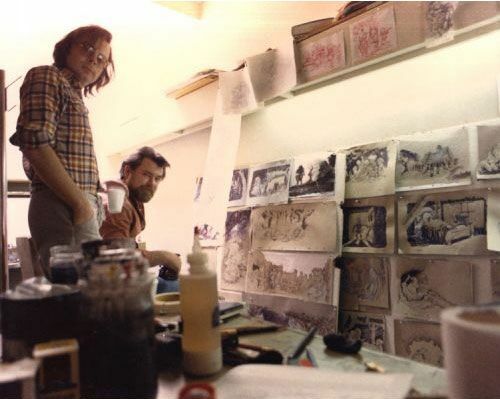 Ian Miller (left) and Mike Ploog (right). VR: Did any particular artist or film influence your art on Wizards? IM: My mother was a theatrical milliner in London when I was young. I went to the cinema every Saturday afternoon with my mother, sometimes to see films she had helped dress. Bastions and heaps of every shape and configuration abounded there. Though I knew them all, in most cases to be little more than structures of canvas and wood, paper cut-outs or paintings on glass it mattered not a jot, I willingly filled them out with substance and imaginings all of my own. Cowboys, Knights Indians, soldiers in red coats they were all there, charging about on the silver screen and afterwards around my bedroom walls and across the ceiling, usually in hot pursuit of the fat, green faced magician from Sinbad the sailor, who frightened me a good deal more than the cannibal that appear nightly at my window. My mind in truth was a visual whirligig. I bought all this to Ralph’s studio, along with the arrogance of youth and seven years of art school study. Everything Ralph asked me to do felt like familiar territory. Durer, Rackham, were always close by. VR: When you revisit Wizards (if you do), what specific scenes are favorites of yours where your work is concerned? IM: I watched it recently and was surprised how engaging and relevant it all still seemed. It sparked and vibrated with an ageless energy, and offered up, in my opinion, a bag load of creative pointers for independent minded animators working today. As to mine own contribution, I don’t have any particular favourites. I see my work as elaborate wallpaper, and having remarked on it in passing you turn your real attention to the action unfolding in front of it. VR: Do you have any special memories or interesting experiences while working on Wizards? 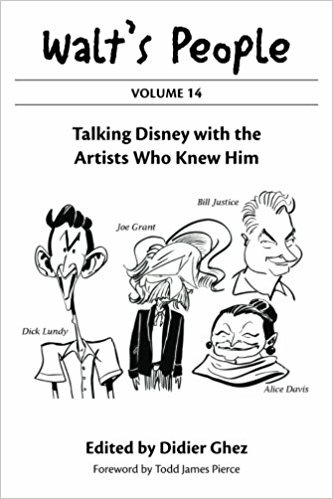 With Ralph Bakshi? IM: Barrel loads. I was lucky. My association with Ralph was a dynamic and never to be forgotten experience. Sometimes I liken it to: Trench warfare for the artists. You lived ever second of it, whizz bangs screams and all. It was sometimes exhausting, but it was never ever boring, or middle of the road. I think he sometimes thought of me as a poisonous hobbit, a creature to be be avoided, but I choose to view this as an endearment. In fact I have a sketch of me by Ralph in this poison dwarf / hobbit persona. Hollywood was a sweet and sour experience for my wife and I. It was place that seemed so familiar on the one hand but on the other extremely alien. Ralph was extremely generous and did everything he could to make my time in LA comfortable. There were a great many funny interludes and get togethers with Ralph but they are the stuff of quit reflection and a private titter now and then.